Director Davis Guggenheim eloquently weaves the science of global warming with Mr. Gore’s personal history and lifelong commitment to reversing the effects of global climate change. A longtime advocate for the environment, Gore presents a wide array of facts and information in a thoughtful and compelling way. “Al Gore strips his presentations of politics, laying out the facts for the audience to draw their own conclusions in a charming, funny and engaging style, and by the end has everyone on the edge of their seats, gripped by his haunting message,” said Guggenheim. 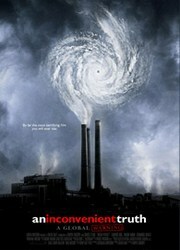 An Inconvenient Truth is not a story of despair but rather a rallying cry to protect the one earth we all share. “It is now clear that we face a deepening global climate crisis that requires us to act boldly, quickly, and wisely,” said Gore.